The original bow of H.M.A.S. 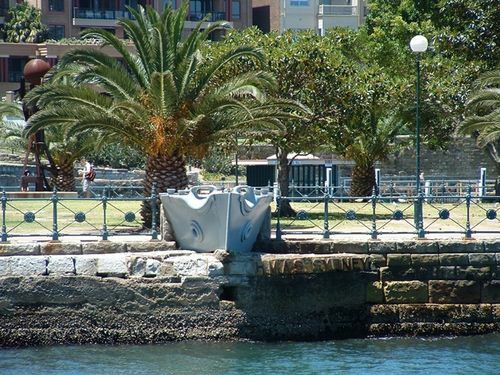 Sydney commemorates Australia`s first Australian naval victory in World War One and the sinking of the German raider Emden at Cocos Island in November 1914. On the 9th November 1914, the German light cruiser SMS Emden attacked the British cable station on Direction Island and was engaged several hours later by HMAS Sydney, an Australian light cruiser. 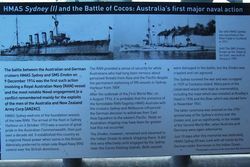 The battle was the first single ship action fought by the Royal Australian Navy. Glossop used his speed and the superior range of his guns to stay out of reach of the German guns and avoided further damage and casualties. Meanwhile, his own gunners gradually found their marks, inflicting sustained and increasingly accurate fire on Emden. After taking extremely heavy damage from almost 100 hits, and suffering dozens of casualties, Müller decided to beach Emden on North Keeling Island to avoid sinking at 11.15am. 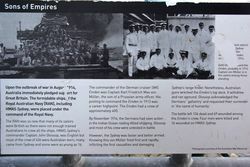 The survivors from Emden were captured and Emden was destroyed. Emden's crew suffered 131 killed and 65 wounded, from a total complement of 360. Sydney had three killed and eight wounded.